Gold Dredge Technology – How Does It Work? Modern day gold mining equipment has come a long way since the famous California gold rush era. Old time miners could not have even dreamt of such advanced gold prospecting equipment that allows finding precious metals much easier and more efficiently. The recent jump in virtually all precious metals prices has ignited interest in even more prospecting individuals and hobbyists looking to earn extra money while doing something they enjoy. Having the right tools will make the process easier and more enjoyable. Below you will learn how these machines operate and what to look for in certain models. Most people think that gold is found in small or large chunks directly in the ground, in actuality, sandy or gravel river banks contain large deposits of alluvial yellow precious metal. Alluvial deposits come in forms of loose pellets or even gold sand. In the past, people used to apply rudimentary precious metals panning methods by sieving river dirt through mesh like trays in hopes of finding precious deposits. This method was very labor intensive and not very efficient. Modern day gold dredge machines enable miners to go through massive quantities of streambed material in short amount of time and locate even the tiniest pellets of precious metals. Gold dredge equipment usually comes in two groups, surface dredges and underwater devices. Underwater gold dredges enable miners to initially locate approximate area for precious metals prospecting, while surface dredges help obtain even the smallest sluice pieces. Gold dredge equipment works similarly to large vacuum cleaners by sucking underwater material like rocks, minerals, gravel, dirt and forcing it through a sorting system that is usually positioned over the water surface. At this stage heavier deposits of yellow precious metal are separated from the rest of riverbed material and placed in a separate compartment. The processed gravel material is washed back into the water. 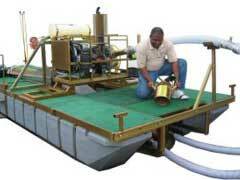 The size of dredge machines is established based by the suction hose diameter. An average market price for a small scale 2-5” gold dredge machine is around $5,000 that is often used by smaller scale gold mining operations consisting of no more than two men . Larger scale mining companies utilize professional grade gold dredge equipment that can process even larger capacities of riverbed material to extract especially hard to find precious particles. Naturally occurring river ground erosions enabled today’s gold miners to extract even more gold in the areas that were previously considered barren. Gold dredges’ relatively low price and ease of operation with just a little bit of trying will make a savvy prospector from just about anybody.